I have been following Jhene Aiko since her days with B2K. Sailing Soul(s) was the soundtrack to my life for at least 4 years. So, when she announced that she was realizing a book of poetry, I knew I needed to get my hands on a copy. 2Fish was released late 2017. I went into reading the book with a very open mind. Yes, she is a creative, and yes she makes beautiful music, but I didn’t know what to expect of her poetry. The first thing that I noticed and loved about the book, is she intertwined her actual written thoughts, ideas, and words within the text. Her actual notebook pages add an extra special touch. Like most creatives, sometimes the thoughts come out on paper sloppy with scratches and doodles. With adding in those intimate creative moments and sharing it with the world gives, the book an extra personal look into her life. She shares stories and poems that are dedicated to her brother who passed away. She address topics such as body image, being an adult, love, and transitioning though different spaces in life. Each poem is named by the number it is, followed by the word fish. Hence the title, 2Fish. My favorites of the bunch are 9Fish, 19Fish, and 69Fish. The poems are overall pretty short and I would consider it a quick and easy read. It took me about 30 minutes to read the whole thing! 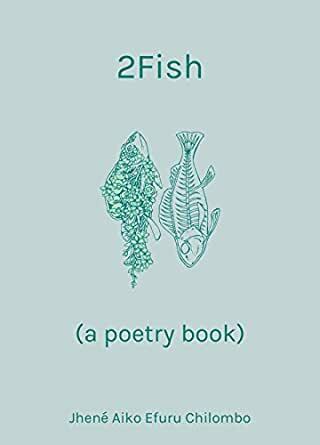 If you’ve read the 2Fish already, what was your favorite poem? If not, what is your favorite book of poetry? Let me know in the comments! Tags: 2Fish, book club, books, Inspiration, jhene aiko, Life, Poetry, reading. Bookmark the permalink. Previous post ← Am I Woke Enough?